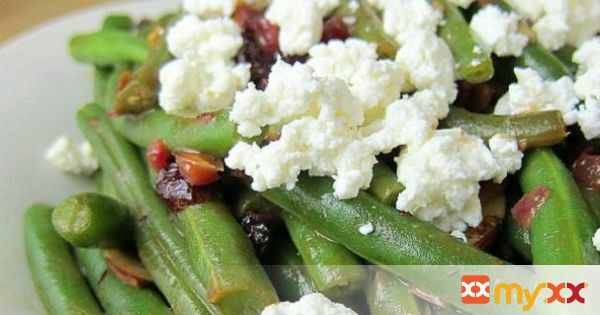 These green beans are cooked to a perfect crisp tender consistency and tossed in a fig balsamic glaze with cranberries and toasted almonds. Never eat boring mushy green bean casserole again! 1. Cook the green beans: Either steam them, or boil them. If boiling, bring a large pot of water to a boil, and cook the green beans until crisp-tender, or however you prefer to eat them. (It takes about 5 minutes to cook the beans to crisp-tender, and I really dislike overcooked vegetables so I watch them carefully.) When the beans are cooked, carefully drain the water and rinse the beans under cold water in a colander until they are no longer hot. 2. Toast the sliced almonds in a small skillet over medium heat until they just start to brown. Set aside. 3. Combine the balsamic glaze and Dijon mustard in a small bowl and mix well until all the mustard clumps are gone. 4. Finely dice the half of the red onion. 5. In a large pan or a wok, saute the red onion in olive oil for 5 minutes, or until the onion has softened. Add the salt and stir. 6. Add the balsamic glaze mixture and the dried cranberries and let them cook together for a minute. Add the green beans and the toasted almonds and gently toss them in the wok to coat them in the balsamic glaze. Remove from heat. 7. Serve with crumbled goat cheese. Make sure to get some of that cranberry/almond saucy goodness that might sink to the bottom of the serving dish.